Coal Action Network activist at the now mothballed Mataura briquetting plant – supposed to provide local jobs, but didn’t. 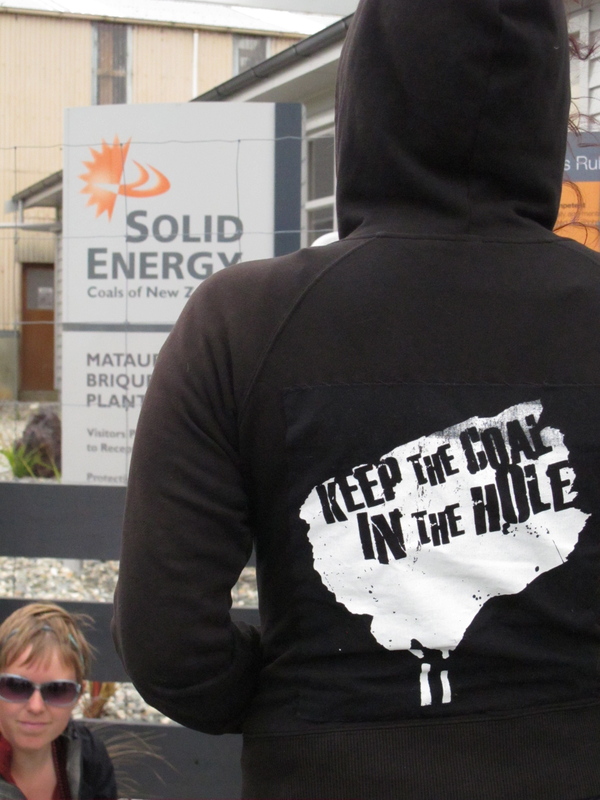 Further layoffs expected today at Solid Energy’s Stockton mine are a warning that coal cannot be relied on for community prosperity and jobs says Coal Action Network Aotearoa (CANA). CANA’s new report, Jobs After Coal – a Just Transition for coal mining communities, released two weeks ago, documents the reasons for the world-wide decline in coal mining and argues strongly that workers should not be left to bear the burden of redundancies. A “Just Transition” would provide central government help for a community-led process to analyse where the skills of miners can be transferred to other industries and develop local economic development based on local skills and opportunities. The report provides some snapshots of what other communities overseas have done to reinvent themselves after coal mining, and concludes that the West Coast could do the same with some government resources. Are you ready to march against the TPPA?